Construction of the new garage was well on its way as of Sunday. 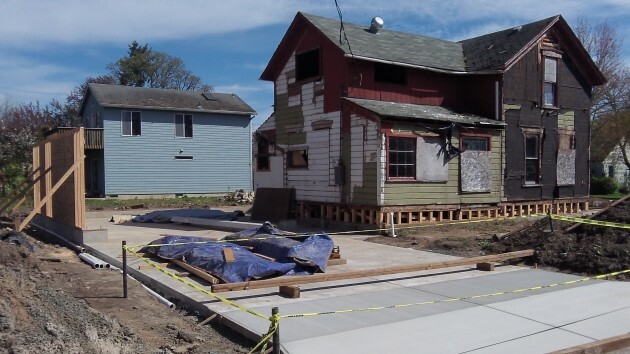 Since last you read about the “Old-Book House,” there’s been progress on this reconstruction project at 1405 Front Ave. N.E. Among other things, as you can see, the old side wing has been scrapped and replaced with a new concrete foundation and slab and the beginnings of the framing of the new garage. As I mentioned in February, the house dates from 1900, and the exterior was seriously dilapidated when Sean Sullivan of Superior Carpentry and Homebuilding bought it last year and resolved to reconstruct it. The property in Albany’s Willamette Neighborhood is on my riverfront bike route, and I could not help but take notice of the start of this rejuvenation. When it’s done, Sullivan plans to name the house “Lola Rose” in honor of the late Lola Skelton, the longtime owner and resident who was fond of roses. That sounds nice, but I call the place the Old-Book House because when the renovation started, a 1907 edition of “American Railway Transportation” by Emory R. Johnson was found inside a wall. This detailed description of railroading had been checked out from the Albany Public Library, probably in the 1930s, and never returned. As you may recall, the discovery of the book made a bit of a splash here as well as in the Albany Democrat-Herald and on ABCNews.com. After Sullivan returned the book to the library, I went to look at it, and the library let me keep it because they have no use for it. So now it’s on my shelf, still waiting to be read more than I’ve had time to read it so far. But it won’t be on the shelf for long. Sullivan thought it would be a fitting gesture if, when he gets the house finished and sells it, we present it to the new owners as a gift. Thank you for the follow-up story Hasso; and for HH-Today, generally.